In the world of the natural and curly hair community, women have been more inclined than ever to practice everything at home when it comes to their personal beauty and haircare--styling, coloring, even trimming their own hair. Although these are great ways to save money, they should be done only after thorough research of what exactly your hair needs has been conducted. Want to save a trip to the beauty shop and start trimming your own hair at home? Purchasing professional shears can safely ease you into the DIY life that most naturalistas choose to lead. 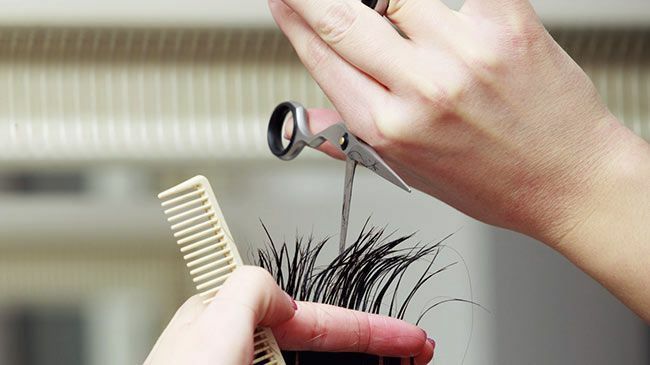 Shears used for hair cutting are about 6 inches in length and have equal sized “eyes” and handles. Other types of shears are designed for very large cutting jobs. Scissors can range in size and can be under 6 inches (and over) in length and usually have one handle that is longer than the other. Scissors are used for lighter cutting tasks. With a harder blade, you will always have uniformity when cutting. Most cutting should feel smooth each time the tool opens and closes. It’s important that every cut feels this way with the scissor to prevent fatigue. Blades should always meet at only one point at any given position and they should be concave, slightly, on the insides. The screws that join that blades should allow a professional to sharpen the blades and reassemble them with ease. The handle of the scissor should have a comfortable “eye” for the fingers to fit. Sizes and shapes of the eyes of handles, over time, has changed. Some are lined in rubber or other plastic finishes to make it more comfortable for fingers to hold and cut over longer periods of time. Be sure to “fit” your scissor handles as you look for the pair that works for you. Look at the scissors from the side (in a closed position). The tips of the blades should meet and you should be able to see between the blades. Open the scissors fully and allow the blades to fall towards one another. The blades should not stay open nor should they close completely, but they should meet about half way. You should have them resharpened by a professional on occasion. You should also add a small drop of oil at the point near the screw to help in maintaining them for a longer period of time.